A new hub for supporting women’s leadership in the Autonomous Region of Bougainville was launched today. 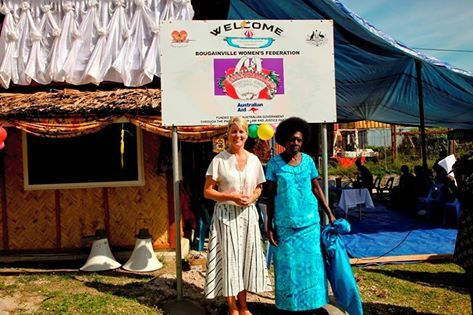 Australia’s Ambassador for Women and Girls, Natasha Stott Despoja, joined representatives of the Autonomous Bougainville Government (ABG) in launching the Bougainville Women’s Federation facilities in Buka. “We are delighted that this hub will assist the Federation to strengthen women’s leadership in the region,” Ambassador Stott Despoja said. “It includes an office that will give women a proper place to work and discuss key issues of concern. It’s appropriate that it’s located at the market where so many women gather to sell their produce." Ambassador Stott Despoja thanked the PNG Regional Member for Bougainville, the Hon. Joe Lera MP, for his contribution through funding furniture and a computer for the office and the construction of a café area also located in the new building. “The café project downstairs will provide women with new skills in running and managing a business and it will provide income for the Federation. It will also ensure women have access to bathroom facilities,” Ambassador Stott Despoja said. Australia provided more than K350, 000 through the Australian aid program to build the office space and support the café. Mr Lera funded the downstairs area, which was contracted through the ABG. Australia supports gender equality in the ABG through a jointly developed and agreed to gender investment plan (2014-19) valued at $14 million. The plan focuses on three key areas: to reduce gender-based violence and provide support services for survivors; strengthen women’s leadership and influence in decision-making; and improve women’s economic opportunities. In consultation with the PNG Government and the ABG, Australia is increasing its aid to Bougainville to support stability by strengthening governance and service delivery, promoting social cohesion and economic growth, and empowering women and youth.